The Access Plus line combines essential features of DoorKing's most versatile solutions with the ease and accessibility of computer programming and control. Each Access Plus Series unit allows Voice and Data connection over either Cellular, VoIP, Wireless, or POTS. DKS offers easy ways to connect fast using the DKS IM Server and DKS Cellular services. With the easy to use Access Plus Account Manager programming software, you can customize the system immediately. Set up time zones, add or delete access codes, set up email notifications, and even lock or un-lock a door with the click of the mouse button. The Model 1808 Access Plus provides voice communication from the entry point between the resident/tenant and guest. Ideal for small apartment and condominium complexes, gated communities, college residence halls, mixed-use buildings, and businesses. The built-in directory will hold up to 12 names and is printed directly from the Access Plus Account Manager software. 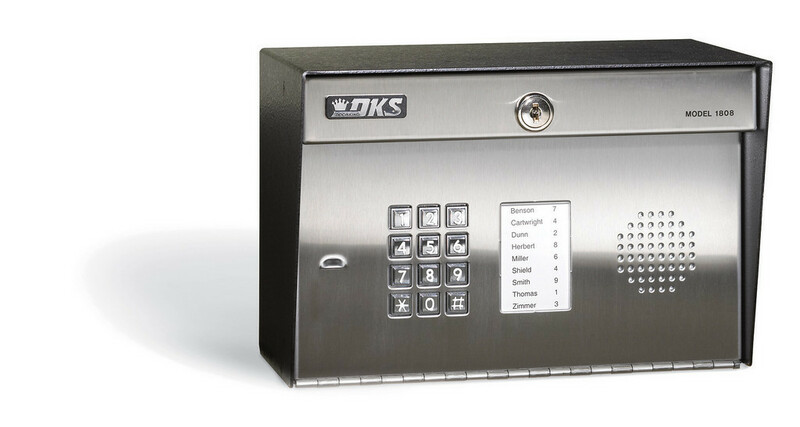 DoorKing's Access PlusAccount Manager Software is a powerful, flexible and easy to use computer program that allows you to manage access control in a variety of controlled access applications.